The Global Citizen Diploma is a high school credential that allows students to qualitatively describe their whole learning in the context of becoming a global citizen and making a contribution to the world. It verifies and validates any experience that students have learned from and allows them to describe their academic and pastoral and extra-curricular learning as practical values and competencies. Earning the Global Citizen Diploma requires a process of deliberate reflection. Students are required to re-examine their experiences, synthesize their learning and make sense of their education as they arrive at a deeper understanding of themselves. Students keep records of their reflection in a publicly accessible, digital portfolio. 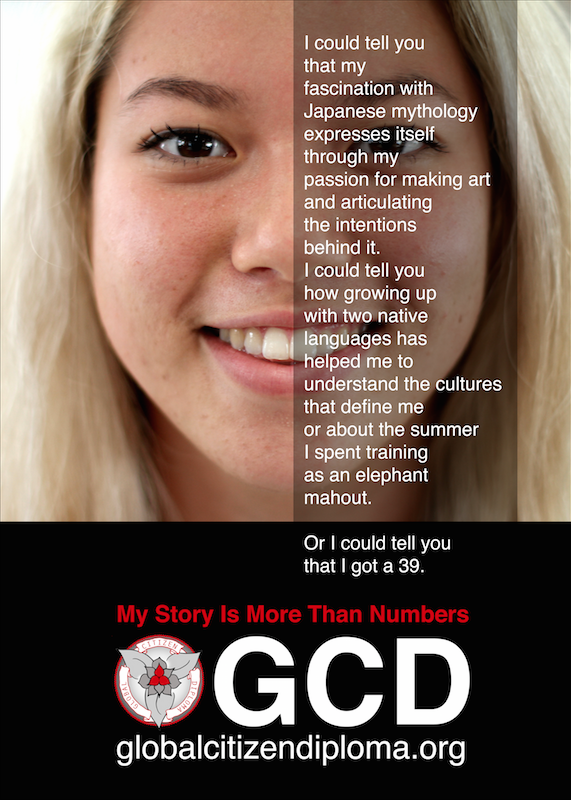 At the end of their diploma, students are encouraged to curate a selection of their most profound learning experiences, a showcase of their best GCD learning. Our counselors can send the showcase link to prospective universities and employers who can see the Global Citizen Diploma candidate’s learning and thinking, authentically, on their own terms.